Helps us think through what shape, color, and texture the gospel gives to leadership. Our world is awash with leadership trainers and gurus, claiming to show how people can do their job better. But Christians only have one role model for leadership in practice – the Lord Jesus Christ. And the leadership he calls us to is radically different to the kind of leadership the world looks to. It is humble and servant hearted. Use this book to grow into the servant-hearted leader that God wants you to be. I found this book to be a really Biblical diagnostic of my expectations and motivations in church leadership. 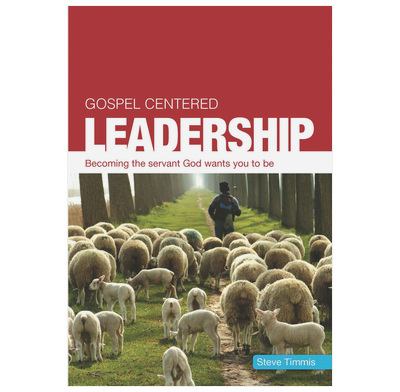 The call to step up in godly leadership is reassuringly balanced by the reminder that it is Christ who ultimately leads his people and we, his under-shepherds, are sheep too! •	The principles underlying Christian leadership. •	The distinctives of Christian leadership. •	The practicalities of Christian leadership. Each chapter follows a simple pattern with a principle, a story to consider, suggested biblical background reading, Steve’s thoughts on the topic, questions for reflection and ideas for action. There is so much wisdom, good common sense and provocative content. He constantly undermines assumptions about leaders and leadership that should be undermined – for example, the idea that leaders are up-front pioneer types, suggesting that many quiet folk can get on with the job of leadership very well and we ought to be encouraging them. The chapter on spirit-inspired consensus and why this is a gospel-type way of coming to decisions is superb; and the one on idealism brings a healthy dose of reality. It won’t surprise you to know that I disagree with his position on women as overall leaders, but it would be a pity not to read the book because of his position on this issue. This would make a great year-long study, not simply to read, but to work out in practice through the year. Steve writes in a way that is clear, engaging and thoroughly biblical. I enjoyed this book because it was clear and easy to read. It was very practical in its outworking and with the questions it makes you consider how you apply what is being said. The bar for biblical leadership is high and we ned to give real attention to it as we seek to build and plant churches in the days ahead. The stakes are high and we are jealous for Jesus's bride and so I would highly recommend this book as a resource for any leader or leadership team. I'm glad to have this resource. I am currently working through it with about four other guys that are small group leaders. Love all in the "Gospel Centered" series as well!